There is an entire industry with an innate economic interest to obstruct, suppress and discredit any information about the eradication of diseases. 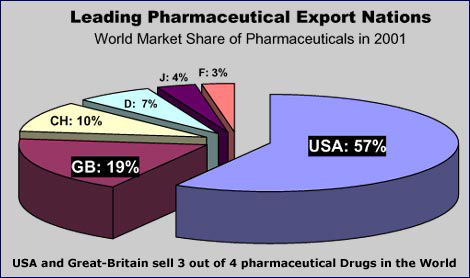 The pharmaceutical industry makes over one trillion dollars from selling drugs for ongoing diseases. These drugs may relieve symptoms, but they do not cure. We have to realize that the mission of this industry is to make money from ongoing diseases. The cure or eradication of a disease leads to the collapse of a multi-billion dollar market of pharmaceuticals. I encourage you to read the key points about the nature of the pharmaceutical business and to think about each of them. With these deceptive statements, the pharmaceutical industry has for decades been able to disguise the true nature of its business - maximum profit from ongoing diseases. As a direct consequence of the pharmaceutical business, more people have died from preventable disease than in all wars of mankind combined. The following summarizes the steps leading to this tragedy. The fact that vitamin C stabilizes the walls of arteries, for example, has been known for 200 years, ever since James Lind uncovered vitamin C deficiency as the cause of blood loss and scurvy. Any head of a pharmaceutical company, any Ph.D. or M.D. who denies knowing this fact is simply incredulous. Why, then, was this information not applied to medicine in order to combat cardiovascular disease? Why was the official RDA for vitamin C set at 60 mg, an amount barely sufficient to prevent scurvy but certainly low enough to make sure that cardiovascular diseases will become an epidemic? Throughout this century, the pharmaceutical companies knew that an optimum vitamin supply of the population would lead to the collapse of a multi-billion dollar market of prescription drugs. Moreover, vitamins are not patentable and the profit margins are low. How is it that millions of people are still willing to pay billions of dollars to the pharma-cartel for medicine that does not cure and frequently harms? The answer to this question is that over the past century the pharma-cartel and their army of lobbyists have built an intricate maze of control, infiltration, economic incentives, bribes, manipulation, and deception. In the future no nation can afford to burden its economy with a pharmaceutical industry that grows like a cancer at the expense of the people, of corporations and of the public sector, all of which suffocate from exploding health care costs for a medicine that does not cure. 500 years ago, the Roman church was making billions of Thaler (early dollars) by selling indulgences, an imaginary “key to heaven” for its believers. Then the fraud scheme collapsed and with it much of the power of the church. Today, the pharma business uses the same fraud scheme. the deception that the pharmaceutical industry is interested in your health. Considering this unhealthy state of affairs, the urgency for a new health care is obvious. The liberation from this insane yoke of the pharmaceutical industry will immediately and directly benefit millions of people, the business community and the public sector of all nations. This new health care system is based on an improved knowledge and participation by millions of people. Basic health has become understandable, doable and affordable for everyone. The era in human history when health was delegated to an industry that shamelessly took advantage of it is over and gone. The new health care system focuses on primary health care, prevention and eradication of diseases. Health consultants and health centers will replace many medical high-tech centers of today. Every health food store is the beginning for a community health center. The new health care system is being built by dedicated lay people together with a growing number of doctors and health professionals. The majority of health professionals are realizing that they themselves had been compromised by pharmaceutical companies and had become victims of a drug-centered health care.